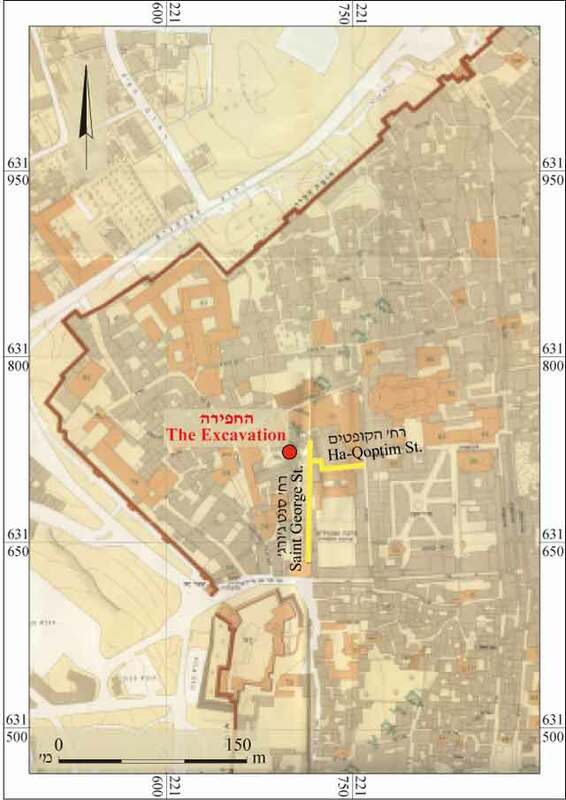 In July–August 2011, a salvage excavation was conducted in a building at 2 St. George Street, at the corner of Coptic Street in the Christian Quarter of the Old City of Jerusalem (Permit No. A-6252; map ref. 221733-48/631686-700; Fig. 1), prior to renovations. The excavation, undertaken on behalf of the Israel Antiquities Authority and financed by the Custody of the Holy Land Monastery, was directed by A. Landes-Nagar (field photography) and H. Barbé (pottery reading), with the assistance of N. Szanton (antiquities inspection and exposure), N. Nehama (administration), V. Essman and Y. Shmidov (surveying and field plans), E. Belashov and D. Porotsky (drafting), A. Peretz (field photography), C. Amit (studio photography), J. Bukengolts (pottery restoration), I. Lidsky-Reznikov (pottery drawing), H. Rosenstein (metallurgical laboratory), B. Ouahnouna (glass), D.T. Ariel and A. Berman (numismatics), L. Di Segni (Greek inscription), A. Boaretto (C14 analysis) and N. Sapir (Jerusalem Old City district archaeologist). 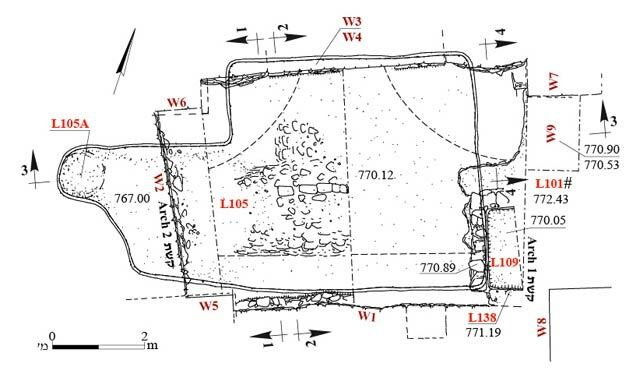 A room in the northern part of a monumental building from the Crusader period was excavated, and the southern and western parts of the structure were documented (c. 653 sq m, length 36.5 m, width in the east 26 m, width in the west 9.8 m; Fig. 2). Nineteen pillars (W5–W8, W10–W24) of various dimensions, and supporting cross-vaults and barrel vaults, which were engraved with eighteen stone masons’ marks, were discovered in the parts of the building that were excavated and documented. 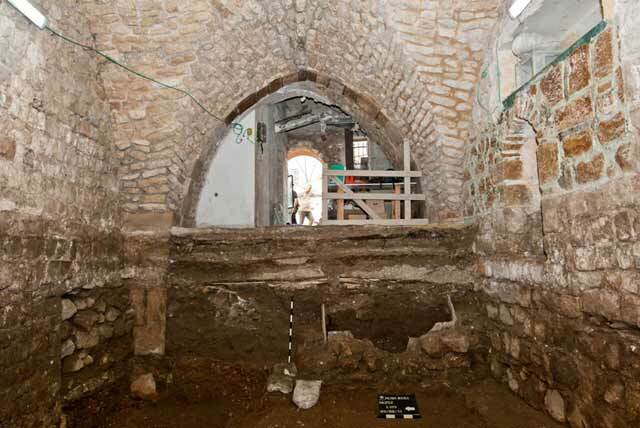 A small area (5.0 × 9.3 m) that serves today as a residential room was excavated, exposing five strata (1–5) ranging in date from the Crusader period to the modern era. The division into strata and their dating was based mainly on three floors (L101, L106, L119) that were revealed throughout the room. Floor 106 was built during the Crusader period and was probably the building’s original floor. Floor 119 was constructed, at the earliest, at the end of the Ottoman period and Floor 101, no earlier than the nineteenth century and is still in use. Four pillars (W5–W8; exposed width 1 m) were exposed in the corners of the room. Except for Pillar 8, they were revealed to their full height, from the foundation to the top (max. height 2.7 m). Pillars 5 and 6 were c. 0.5 m taller than Pillar 7, perhaps because of the topography. The pillars were founded on stones of different sizes bonded with gray mortar containing lumps of lime and charcoal and were built of large soft limestone ashlars (c. 0.35 × 0.65 × 1.00 m) with diagonal stone dressing. The pillars support two arches (1, 2; Fig. 2) and a cross-vaulted ceiling. The arches were constructed of well-dressed medium–large stones showing combed stone dressing. The cross vault was built of small–medium roughly hewn stones bonded with white mortar made of crushed chalk. The center of the vault was built of two rows of dressed stones: one of medium-sized stones oriented east–west and the other of small stones aligned north–south. The rows of stones were perpendicular to each other and formed a cross. A floor (L106; height 2 cm; Figs. 5–7) made of tiny gravel-like fieldstones tamped in soil abutted the foundation courses of the pillars. 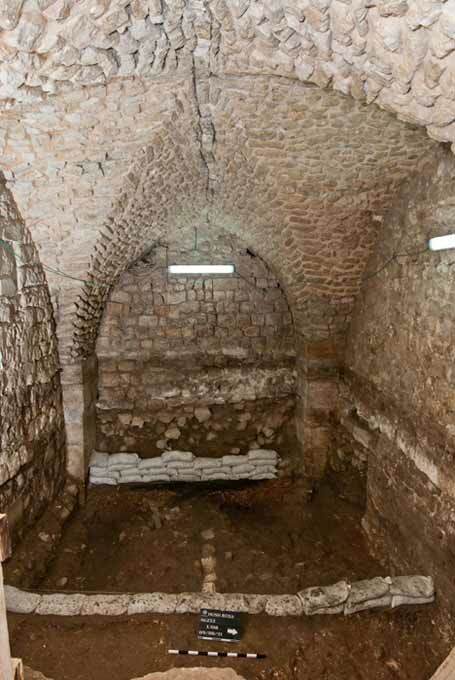 The floor was placed directly on the roof of a water cistern (L105), and the ceramic finds discovered in it date at the latest to the Crusader period. The cistern is rectangular (L105; 5.1 × 9.2 m, height 2.8 m), partially built and partially hewn, and plastered. Its plan was adapted to conform to the location of the pillars. An ashlar-built shaft was installed at the western end of the cistern and its ceiling (max. thickness 0.4 m) was constructed as a barrel vault using small–medium-sized fieldstones, some of them roughly hewn. The stones were secured in place with gray mortar containing gravel, chunks of limestone and charcoal. A spine of well-dressed medium–large white limestone blocks oriented east–west extended on the extrados (outer curve of the cistern), along the center of the vaulted roof. The spine was designed to provide support for the ceiling. The direction, type and position of the stones in the spine matched those of the spine located in the vault of the hall above it. The cistern’s foundation was built of roughly hewn medium-sized stones set atop terra rossa soil and the bedrock. The walls and floor of the cistern were treated with two layers of plaster. The outer layer was a thin application of gray cement. The inner layer was pink (4.5–6.0 m thick in the floor) and contained grog, lime and charcoal. In the center of the floor was a small section of white plaster that contained flax fibers. The two layers of plaster and their different composition in a small section of the floor attest to at least two periods of use. The last repair and maintenance of the cistern were apparently carried out in the Ottoman period, based on the cement plaster that covered its sides and floor and the flax fibers discovered in its floor. Other examples of a similar plaster composition containing flax were discovered in the excavations of the Western Wall tunnels by A. Solomon (pers. comm.). The cistern was empty and devoid of soil or debris. 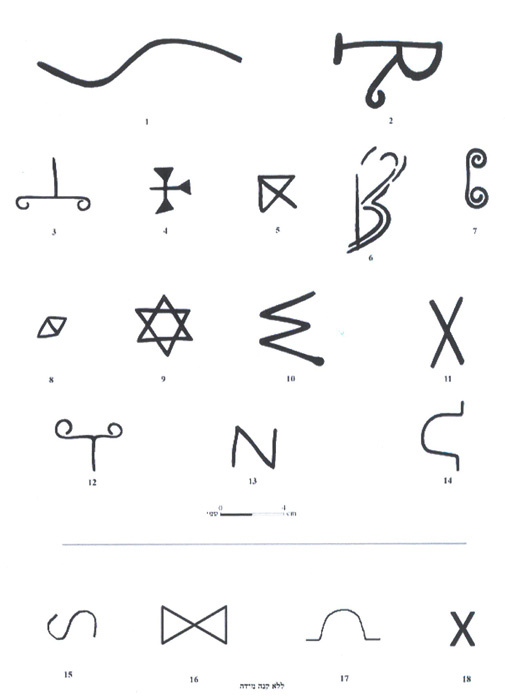 Stone masons’ marks were discerned on Pillars 5 and 6 (Fig. 9:11, 1 respectively). An especially large concentration of eleven stone masons’ marks was discovered on Arch 1 (Figs. 9:2–7, 9, 10, 12, 13, 18; 10). A C14 sample taken from the foundation of Pillar 5 indicated that the sample most probably dated to the twelfth century CE. A similar result was obtained from the mortar sample taken from the core of the vault in the cistern’s roof. 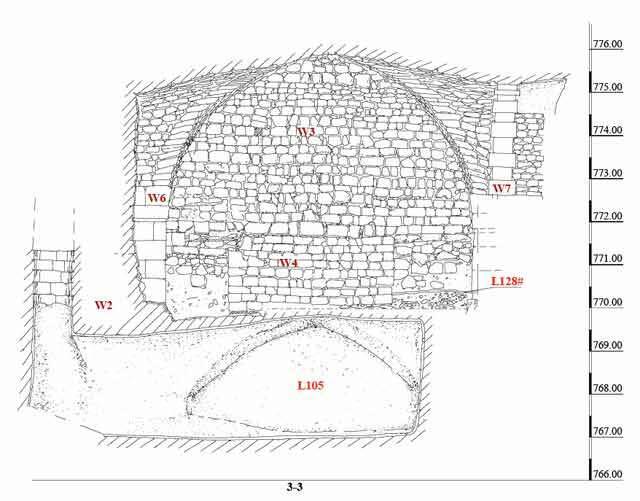 These analyses, as well as the fact that the architectural plan of the cistern matched that of the pillared structure and that the cistern was located beneath Floor 106 indicate that the cistern was installed in the twelfth century CE, at the time the building was erected. The remains between Floors 106 and 109 are attributed to this stratum. Two phases were discerned: an installation (L109), a wall of another installation (W4), a wall (W9) and a charcoal layer (L127; Fig. 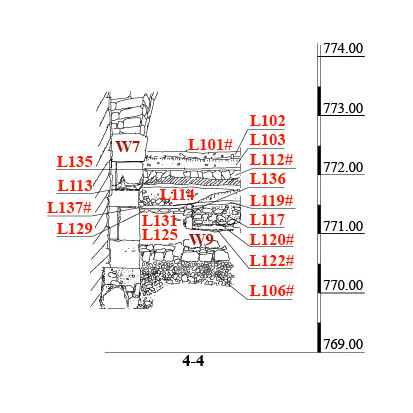 4) belonging to Phase 1, and the walls of the residential room (W1–W3) and an installation (L117; Fig. 7) belonging to Phase 2. All the remains from this stratum, apart from Installation 117, were discovered directly on top of Floor 106 of Stratum 1. Phase 1. An installation (L138; length 1.8 m, width c. 0.65 m, depth 1.15 m; Figs. 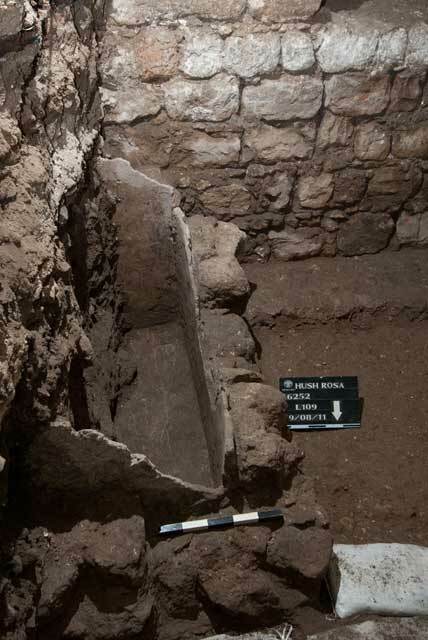 5, 11) was exposed in the southeastern corner of the room; its plan and outline were not determined because its eastern part was situated beyond the limits of the excavation. The installation was built and plastered and preserved to a height of three courses. Its walls (width 0.30–0.37 m) were constructed of roughly hewn medium-sized fieldstones. Three layers of plaster were applied to it: an outer layer of light pink plaster containing small pieces of grog and lumps of limestone; a light gray middle layer containing small lumps of limestone and charcoal; and an inner layer, adhering to the stone wall of the installation, containing large potsherds. The ceramic finds recovered from the fill inside Installation 109 date to the Crusader, Mamluk and Ottoman periods and as late as the nineteenth century CE. The southern wall and corners of an installation (W4; width 3.85 m, height 1.45 m; Fig. 6), most of which extended beyond the boundaries of the excavation, were exposed on the bottom part of the residential room’s northern wall (W3). The installation was built on Floor 106, between Pillars 6 and 7. Exposed Wall 4 was constructed of eight courses of medium-sized stones bonded with white mortar containing lime and lumps of charcoal. A white floor (L128; height 0.14 m), made of small hewn pieces of limestone bonded with lime and granulated charcoal, abutted the bottom course of the installation’s wall from the east. Wall 9 (length 1.5 m, width 0.7 m, height 0.37 m; Fig. 7) was also exposed on top of Floor 106. Its northern end abutted the southern face of Pillar 7 and its southern end extended beyond the limits of the excavation. The wall was preserved two courses high and consisted of two rows of dressed and roughly hewn medium-sized and large stones. Light gray plaster (thickness 1 cm) containing granulated chalk and charcoal was revealed on the wall’s eastern face. The wall ceased to be used at the beginning of the Ottoman period based on a coin dating to 1574–1617 CE (IAA 143114) discovered in the fill (L125) above it. The ceramic finds recovered from this fill date to the Mamluk period. A thin layer of charcoal (L127; Fig. 4) was exposed adjacent to the foundations of Walls 1–3, throughout the entire western part of the room and penetrated the top of Water Cistern 105. Phase 2. Walls 1–3 were built on top of Floor 106, as high up as the inner curve of the vault (intrados). The walls adjoined Pillars 5–8, thereby blocking the passages between them. Remains of Floors 119 (Stratum 3) and 101 (late Stratum 5), which abutted the walls, were found on top of these walls. The southern wall (W1; width 6.4 m, height 5.7 m) was constructed of medium-sized and large building stones, including dressed stones in secondary use, and contained several niches. The western wall (W2; width 4.1 m, height 4.75 m) was built of medium-sized building stones, and the side (W4) of the installation of Phase 1 (Fig. 6) was incorporated in its northern wall (W3). To construct the wall, the cavities (A, B) between both sides of the wall and Pillars 6 and 7 were filled with various-sized roughly hewn stones and small fieldstones. Fill B was deposited directly on top of Floor 128. Wall 3 was built to a height of 20 courses (width 7.15 m, height 4.3 m) on top of the fills and the side of the installation. The lower course, which was set on W4, was built of well-dressed medium-sized and large stones, and the rest of the courses consisted of medium-sized and several large building stones and small roughly hewn fieldstones. Dressed stones with combed stone dressing were incorporated in secondary use in the wall’s construction. The mortar bonding the stones in the wall contained earth and lumps of lime. A square installation (L136; length 0.8 m, width 0.5 m, depth 0.45 m; Figs. 7, 12) comprising two phases was exposed above the fill (L125) that sealed W9. In the first phase, it was constructed to a height of four courses using small and medium-sized roughly hewn building stones. A white floor (L122; thickness 3 cm) made of lumps of limestone and soil abutted its walls. In the second phase, the floor was canceled and another white floor (L120; thickness 2 cm) containing lumps of lime and some ground charcoal was installed on top of it. Remains of a crushed chalk tamped floor (L137; thickness 2 cm) abutted the installation from the north and Pillar 7 from the south. Its foundation (L129) was built of small fieldstones. The installation was constructed atop Fill 125 in which, as mentioned above, a coin was found, dating to the years 1574–1617 CE (IAA 143114) and therefore, did not predate the Ottoman period. Based on the fill (L117) blocking it, the installation was no longer in use by the second half of the eighteenth century CE. The installation and Floor 137 sealed Floor 119. Floor 119 (height 4 cm; Fig. 7), which was white and made of crushed and tamped chalk, extended throughout the room between the pillars in its corners and abutted Walls 1–3. 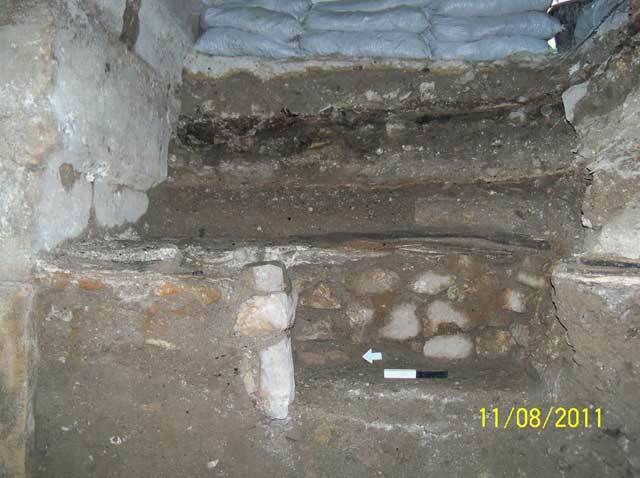 A thin black habitation layer up to 5 cm thick covered the floor, which ceased to be used following the construction of the floor above it (L112). Floor 112 (Figs. 5, 7), which was exposed between Pillars 7 and 8, was built of roughly hewn medium-sized fieldstones bonded with soil. The floor bedding (L113) contained earth and small pieces of limestone, and the faience discovered in it indicates that the floor was not installed prior to the nineteenth century CE. The stone floor was covered by a thin black habitation layer (L135; max. thickness 5 cm) and ceased use following the construction of the floor above it (L101). Floor 101 (Fig. 7) was characterized by granite tiles set on a foundation of concrete and iron mesh (L102). This pavement was from the last flooring phase of the residential room and the time the room was in use, until the renovation. The floor was installed in the late nineteenth–early twentieth centuries CE, and not prior to 1878 based on a faience vessel that bears the embossed the name of the manufacturing plant, which was discovered in the fill (L103) below Foundation 102. This part of the building was discovered abandoned and neglected, and at the time of the documentation, served as a storeroom and refuse dump. A series of cross-vaults and barrel vaults resting on massive pillars built of large ashlars bearing signs of diagonal stone dressing (Fig. 13) was documented; Pillar 10 was unusually wide (c. 4.5 m; Fig. 14). Lateral arches and vaulted openings were observed in the building, belonging to several construction phases. The differences in elevation between the tops of the pillars and the floor indicate that the floor level in the room was raised at some point. Remains of white plaster were exposed on the pillars, vaults and arches. Five stonemason’s marks were discovered: three on Lateral Arch 4 (Fig. 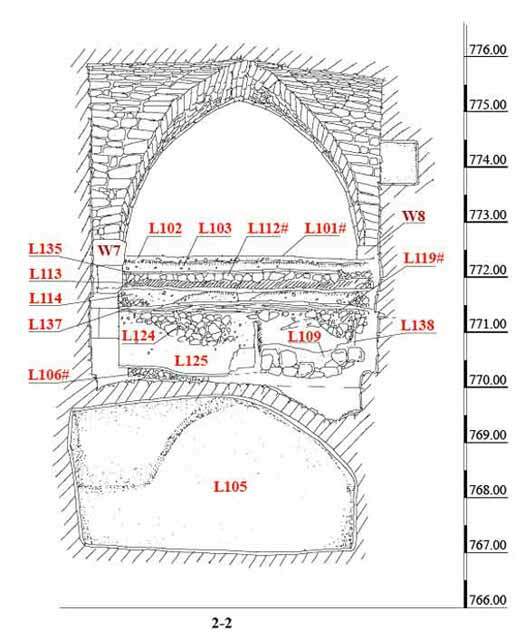 9:15–17), one on Arch 3 (Fig. 9:8) and one on the southern face of Pillar 15 (Fig. 9:14). Remains of a Greek inscription covered with white plaster were discovered on the northern face of Pillar 14. The inscription, which has not yet been deciphered, was probably engraved after the Crusader period, following the transfer of the building from Frankish-Latin to Greek ownership. Three built and plastered installations that could not be dated were exposed in the southern part of the hall. These consisted of a square trough (Installation 1; 0.8 × 0.8 m; Fig. 14), a circular installation (Installation 2; diam. 0.8 m) east of Pillar 14 and a rectangular pool (length 6 m, width in north 4.5 m, width in south 3.7 m) east of Pillar 10. Four walls delineating four rooms were constructed between the pillars. Rooms 1 and 2 have two old wooden doors. In the wall north of the doors was the opening of an ashlar-built shaft (depth 3.9 m) that descended to the western end of Cistern 105. Two ovens were documented west of the shaft. Wooden benches were discovered along the northern, western and southern walls in Room 2. Large metal pots were arranged in a row on the southern bench. Other pots were found scattered throughout the building. 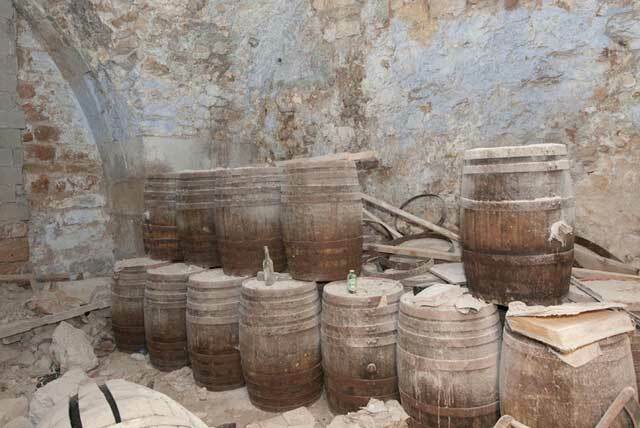 Dozens of old wooden barrels used to store wine imported from Cyprus were found individually and in piles in Room 3 and throughout the building (Figs. 15, 16). 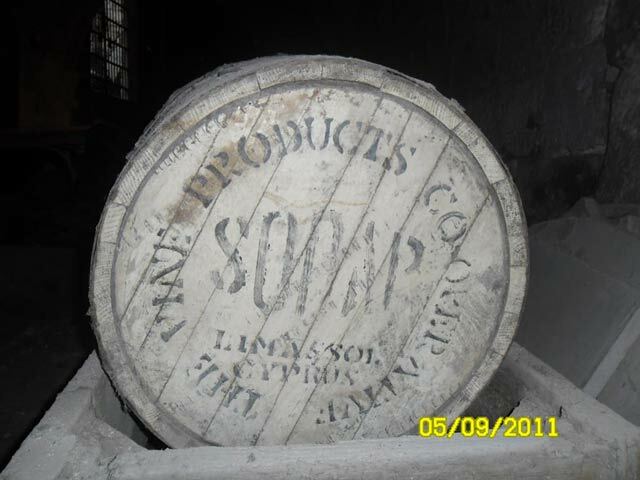 The barrel covers were painted red or white and were stamped with the name and location of the factory: SODAP LIMASSOL CYPRUS THE VINE PRODUCTS COOPERATIVE (Fig. 17). 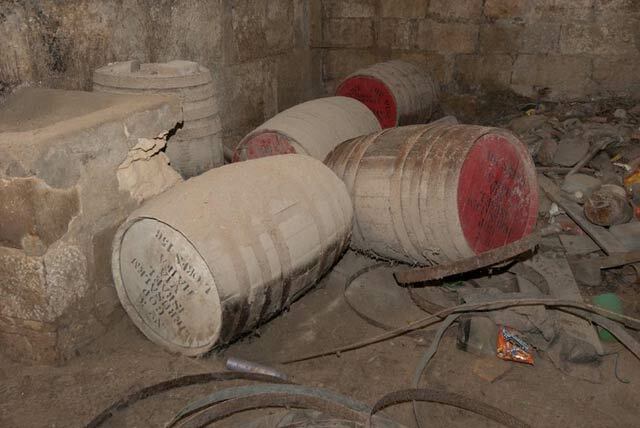 The number of the barrel, its destination, port of importation and another caption, No 2 GOP JERUSALEM ISRAEL VIA HAIFA LOKES 161, all appeared on the bottom of the barrel. The SODAP factory was established in 1947 and is still operating today. In addition, tools, furniture, old metal carts, machinery, a wooden screw press installation and a large amount of detritus were found scattered throughout the area. Judging by its architectural characteristics, this part of the building, which is owned by the Greek Orthodox Patriarchate, was also constructed during the Crusader period. In the last phase it served as a public kitchen and for storing wine, as evidenced by the ovens, the abundance of pots and dozens of wooden barrels scattered throughout the area. 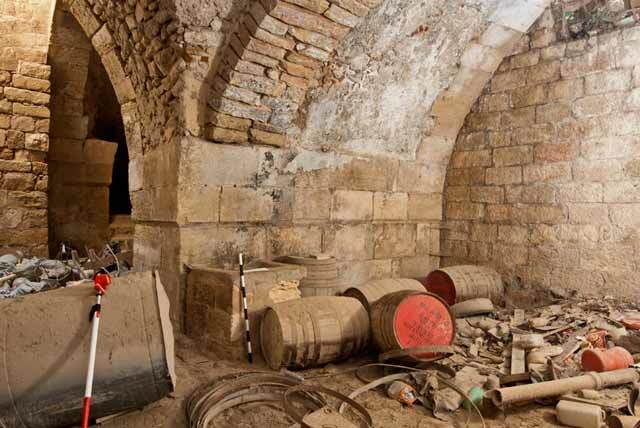 The barrels’ date of manufacture suggests that the building was abandoned in the mid-twentieth century CE. Subsequently, old equipment was consolidated in it and a large amount of detritus accumulated there. A variety of artifacts ranging in date from the Iron Age to the Late Ottoman period were uncovered in the excavation. Some of the finds were discovered in an unequivocal stratigraphic context and the rest reflect activity that transpired in or around the structure. Pottery sherds, glass, coins, stone items and a metal cannonball were found. 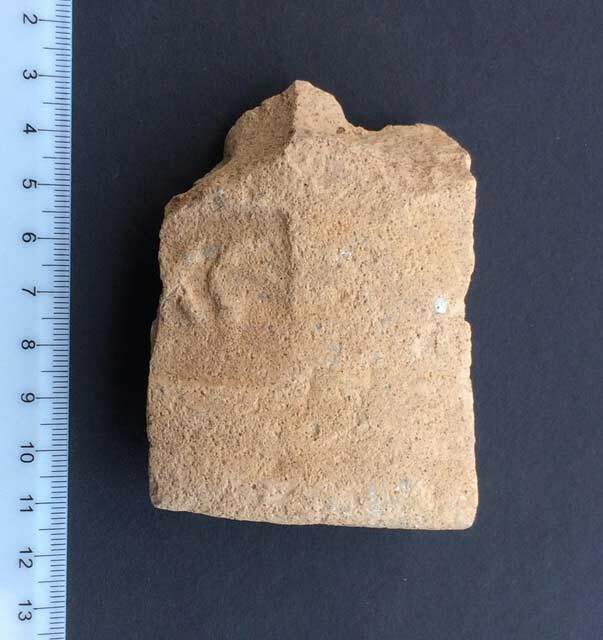 One of the special finds discovered is an imbrex-type roof tile embossed with a rectangular seal impression of the Legio X Fretensis, of which the letters XF have survived (Fig. 18). 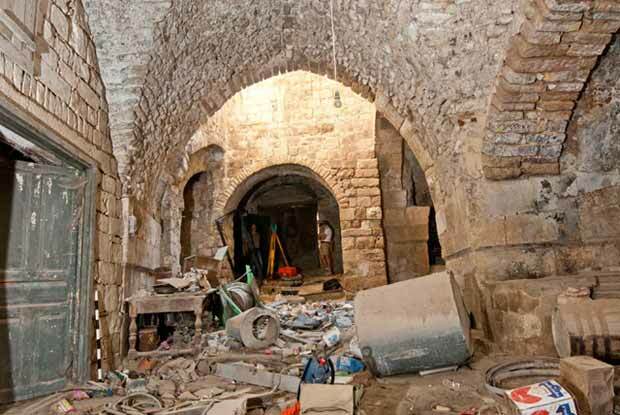 The excavation and the archaeological documentation carried out in the various parts of the building show that this is one architectural complex dating to the Crusader period. 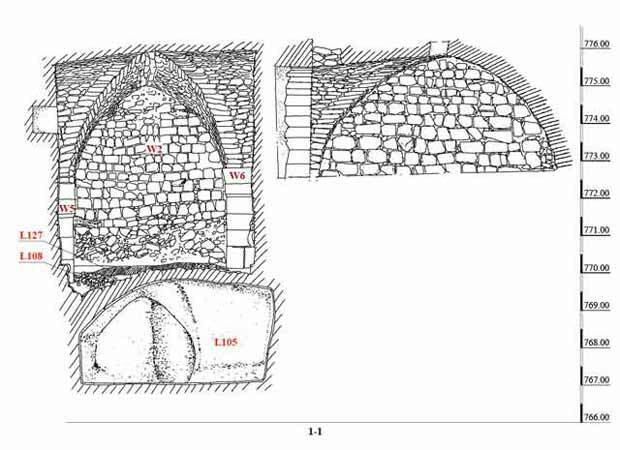 This determination is based on the construction technique, that is, the diagonal stone dressing and stonemason’s marks, the architectural characteristics, ceramic finds and a C14 analysis done with samples taken from the building’s foundations and the ceiling of the water cistern. The complete plan of the building is unknown; however, it seems to extend to the south and east, on the other side of St. George’s Street. Based on the size of the building, its architectural plan and the delicate quality of its stone dressing, the structure was evidently a public building, the purpose of which is unknown. In its first phase, the structure apparently served as a basement or ground floor in a building that was several stories high. This is based on the water cistern exposed below its floor and the barrel vaults incorporated in the building, which function as stable support for the floors above. The building is situated in the center of the twelfth century CE patriarchal quarter, adjacent to the Church of the Holy Sepulcher and is surrounded by churches and public buildings from the Crusader period. The location of the building in the northwestern part of the city alludes to its ownership and importance: until the twelfth century CE, the various quarters of the Old City were inhabited according to religions: Muslim, Jewish and Christian. In the Crusader period, under Frankish rule, the division into quarters was determined according to the inhabitants’ national origin (the Syrian Quarter, Armenian Quarter and German Quarter), their purpose (the Hospitaller Quarter), as well as various Christian sectors. The northwestern quarter was the most important of all because the most sacred location in Christendom stood in its center—the Church of the Holy Sepulcher. Because of its religious significance it was inhabited with Latins by the Latin Patriarch, and the quarter was even referred to as Quarterium Patriarch. The building’s location in this quarter attests to the fact that it was owned by the Latin Patriarchate, and its proximity to the Church of the Holy Sepulcher and the patriarchal palace reflects its public and/or national importance. The finds, including pottery sherds and coins dating to the pre-Crusader periods, allude to activity that transpired nearby during these periods. The roof tile bearing the stamped rectangular seal of the Legio X Fretensis, also attests to the long presence of the legion in Jerusalem, where it was garrisoned until the end of the third century CE. 2. Plan of the building. 3. 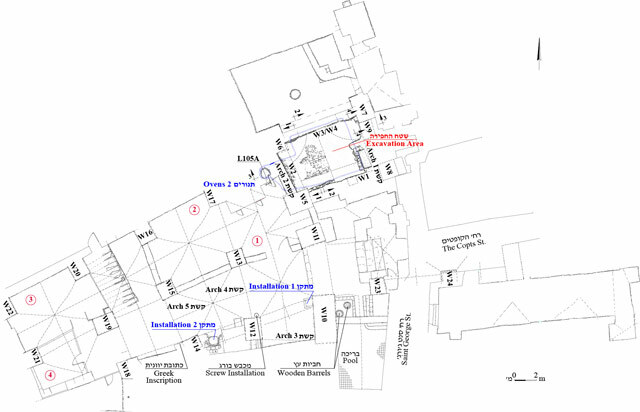 The excavation area, plan. 8. The excavation area, looking west. 10. Arch 1, situated between Pillars 7 and 8 and bearing eleven stonemasons’ marks. 11. Installation 138, looking south. 12. Installation 136, looking east. 13. The southern and western parts of the building; left—wooden doors leading to Rooms 1 and 2, looking east. 14. Pillar 10 and adjacent Installation 1 to the west, looking southeast. 15. Wooden wine barrels stored in Room 3, looking northwest. 16. Wooden wine barrels lying west of Installation 1, looking southeast. 17. A wooden wine barrel with its white cover set in place in a recess, south of Pillar 13; the top of the cover is stamped with the logo of the production plant, looking west. 18. A rectangular imbrex tile bearing the seal of the Legio X Fretensis, of which the letters XF have survived.